Chetham’s Library, Manchester, founded 1653. An inspiring location for a Research Away Day, Jan 2016. With its dark skies, short days and cold temperatures, the month of January can be a bit of a challenge. Yet brightness and hope were in abundance yesterday at the Apparel Research Cluster Leaders’ Away Day. Five of us (myself included, along with my Associate Dean of Research and the trusty Cluster Leaders: Prabu, Shuyu and Kathy) were ‘away’ on the other side of Manchester city centre at Chetham’s School of Music. Our purpose was to discuss strategy and tactics for the continuing development of the Apparel Research Group, which I head up. We did this by thinking about short and long term goals, assigning tasks (the key to leadership is delegation, right? ), planning some future research events, listening to, and learning from, an invited critical friend (the inspiring Professor Martyn Evans from our School of Art) and also, importantly, spending time with each other in a fresh, and therefore, stimulating environment. And, what an environment Chetham’s proved to be! I had booked The Audit Room for our meeting, which is part of a complex of Medieval Buildings arranged around a cloistered courtyard and immaculately manicured formal parterre. The Audit Room boasted a view of the Cathedral as well as its own timbered ceiling replete with grotesque carvings. Our day’s discussions, then, were overseen by a carved Mouth of Hell mask, which adorned the ceiling, and depicted a sinner being ingested in its grisly jaws. Stirring stuff, indeed! Why the blog entry? Well, in answer to that, our day included an archive element. At lunchtime, I had arranged for us to have a tour of the famous Chetham’s Library (founded in 1653), located just upstairs from us. What a sensory experience! As we ascended the staircase, the smell of thousands of books, centuries-old, was all pervading. History is perfumed with an intoxicating, and not unpleasant, mustiness. Raking winter sun shone through the leaded windows. And, best of all, we were permitted to handle some of the books from the collection dating from the seventeenth century. Fergus, the curator, kindly selected some books on ecclesiastical and national dress, richly illustrated with etched drawings on linen rag paper. The Reading Room, where we viewed these, was furnished with artefacts from the 1650s. On the wall, was an elaborate heraldic and emblematic display commemorating Humphrey Chetham and his foundation. Fittingly for us, as research-driven visitors to Chetham’s, this tympanum bore books and torches, symbolic of learning, as well as a cockerel to suggest hard work. Surely, a good omen for the new year and new academic term ahead? 1.Know ‘who’ you are as a researcher or research cluster. Know what you do, do what you do, and do it well. 2. Don’t be a ‘one hit wonder’ and flit from unrelated project to project. Establish a specialism and maintain a track record in a particular research area. Articulate the narrative between your research interests. 3. Don’t be a ‘Jekyll and Hyde’. Bring research and teaching together as closely as possible, even if the fit isn’t perfect. 4. Publicise your research through networking and use social media to ‘get it out there’. Communication of your research is needed both internally to university colleagues and to the world beyond. 5. Be clear about knowing ‘when you’ve got there’. How will you recognise the fulfilment of your goals and aims. What will you do when you’ve reached them? Sometimes academic life is not so bad: last Friday afternoon being a classic case in point. The perfect end to a busy, and at times irksome, week came in the form of a welcome and energising archive visit to my ‘local’ treasure trove: the Hat Works museum, just around the corner from where I live in the leafy suburbs of Stockport. I must say I have a great fondness for this particular museum, housed in a seven and a half storey mill building from the 1830s replete with 200 foot chimney. Indeed, the site and setting is nothing short of awesome, cast in the shadow of a towering Victorian viaduct (which Google informs me is the largest brick-built structure in Western Europe). And it is also able to boast the Plaza Super Cinema and Variety Theatre, a bedazzling 1930s art deco jewel-of-a-place, as a near neighbour, too. Central Stockport, dear reader, is certainly worth a second glance. As the name suggests, The Hat Works, is all about hats. In fact, it’s about a lot more than hats and offers a social history of the City, its industrial past and the people who populated it. The museum, its holdings and its excellent programme of outreach activities have been instrumental in bolstering my interest in hatting and millinery: interests both professional and personal. Alongside my work-related research (and an instance, perhaps, of life imitating art? ), hat-making has become a new hobby for me – an obsession, even – since taking several Hat Works’ classes on blocking, veiling and trimming (with, I hasten to add, varying creative results). Of the emergency weapons for the street, the hatpin leads by all odds. It was used fifty-five times in the last year and no one will question its effectiveness in any emergency. It is dramatic in its possibilities. It is the American stiletto and it has the advantage over the Italian weapon in that it has not yet been classed with concealed weapons. As an article of dress it is not well adapted to use. It is destructive to hat and hair alike but its readiness as a weapon promises to keep it in the dresser of every boudoir. West Side police still talk of a hat pin duel between women a few years ago, in which one of the contestants was stabbed deeply in the neck. Only a few weeks ago a young woman, named Mary Rilley, attacked Sergeant Timothy Cullinan with a hat pin as he stood at the desk of the East Chicago Avenue Station. Only the prompt interference of a patrolman standing near saved him. All of this goes to show that if women are not discriminating fighters at all times, they are at least versatile in their choice of weapons. Last month, and getting in touch with my geographical roots, I returned to the ‘mother ship’ that is the Royal Geographical Society (RGS) at Kensington Gore in London. The occasion was the International Conference of Historical Geographers (ICHG), an enormous 5 day-long gathering with a 40 year pedigree. The logistics involved in organising a conference on the scale of the ICHG are almost unfathomable. Near on 700 delegates, 60% of whom travelled to Kensington Gore from overseas, were in attendance. The conference booklet (which detailed the abstracts of all the presentations) was the size of a telephone directory. Following in the footsteps of Darwin and Livingstone, it seems that present day geographers who frequent the RGS remain up for a challenge. I refer here to the sticks of Brighton Rock supplied in our complimentary conference goodie bags, which were not for ingestion by the faint hearted (or, for that matter, by the weak toothed). 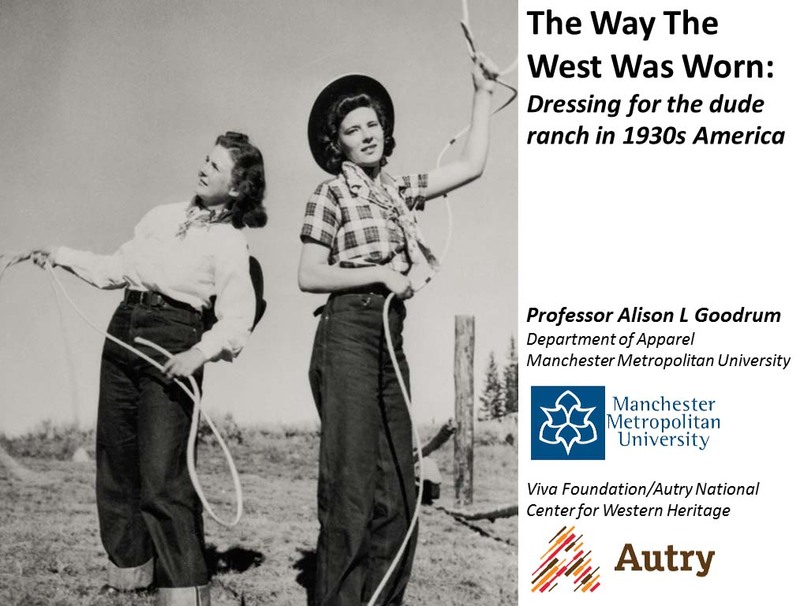 I delivered my paper, on ‘Dressing For The Dude Ranch In 1930s America’, as part of the programme comprising the ‘Materiality and Historical Geography’ session. The session presented me with a well-timed opportunity to test out some of the themes and ideas I had encountered during my Buckskin and Ballgowns project at the Autry museum archives in LA only a month or so prior. I found room in my allocated 15 minute presentation slot to include some of my blogged-about findings on denim and divorce ranches. I also forwarded my thesis: that the dude ranch vacation of the 1930s was not only about holiday makers dressing up as their wild west idols but that it was also a space in which a novel cult of dressing down was emergent. Being short on time, I made full use of the opportunity to illustrate my paper with supporting images, and showed off the rich – and sometimes just plain amusing – visual sources I’d been working with out in Los Angeles. A picture, after all, is able to speak a thousand words. And there is no greater truth when it comes to the ‘hit and run’ scheduling of an academic conference. Many years ago, as a doctoral student, my PhD supervisor assured me that only good things could come of delivering a conference paper. Today, I remain convinced that conferences are worth the effort, or efforts (including those labours that involve searching for the funds to support travel and attendance; actually having something relevant to say; and, mustering the courage to set oneself up in front of peers). One of the ‘good things’ relates less to one’s own work and more to others’. I was thrilled and delighted to share a stage with some other academics working in my broad area (for example, Merle Patchett on the study of incomplete or half-made historical objects, and Bethan Bide on repaired clothing held by the Museum of London). But I was equally thrilled and delighted to engage with subjects outside of my area, too (the BBC 2LO transmitter and the InterCity125 train among them). Also ‘good’ was the Society’s close proximity to Exhibition Road and, especially, to the Victoria and Albert Museum. After my conference session, I hot-footed it (stick of rock and all) to the V&A’s Savage Beauty/McQueen ‘blockbuster’ show, which lived up to all of its rave reviews. Even in its final few days, the exhibition was jam-packed (and possibly even over-stuffed) with visitors taking in the awesome theatrics of it all. 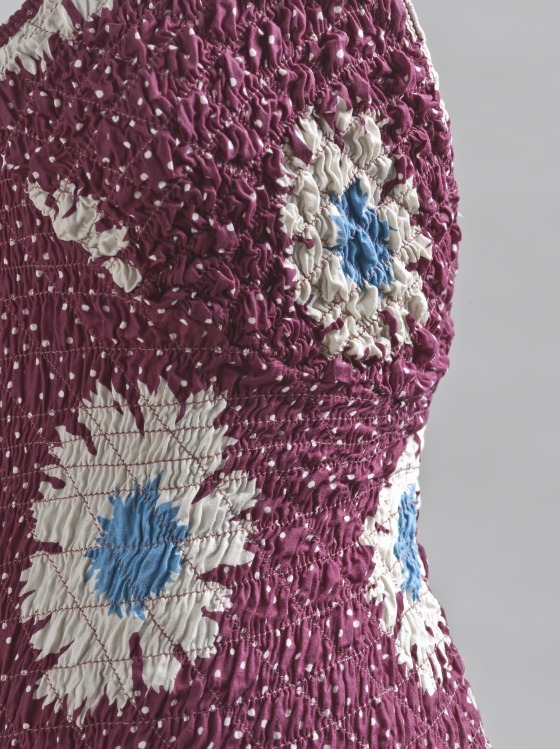 Viewing McQueen’s work tout ensemble was a reminder of just how influential his designs were (and remain), not only conceptually, but also on the more commercial world of the everyday wardrobe, impacting everything from hipsters to peplums. I also managed to squeeze in a late-entry ticket to the new ‘Shoes: Pleasure and Pain’ exhibition, which is bound to be as equally enticing a draw card. But just one thing: explain to me, V&A, why no inclusion of podiatry or orthopaedics? Good things, so the saying goes, are threefold. Thirdly and finally, then, I returned home from my adventures in London to find a copy of my latest publication on the doormat. Good things, in this particular case, come in brown cardboard packaging from Routledge. [Click here for book details – noting chapter 3 in particular]. The ‘Singing Cowboy’ himself, overseeing my daily research activities as the Viva Foundation Fellow 2015 at the Gene Autry Western Heritage Museum, LA. 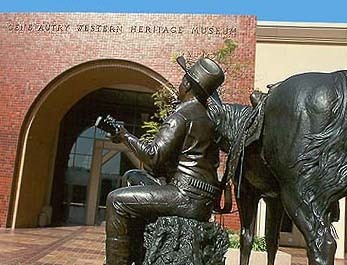 Four weeks at the Autry have zipped by in a flash. And a couple of days ago I gave my ‘Research Frontiers’ lunchtime presentation to co-workers and colleagues at the museum as the culmination of my ‘Buckskin and Ballgowns’ study. ‘Research Frontiers’ is a programme of seminars delivered by the various Fellows hosted at the Autry each year and it offers an opportunity for permanent staff to learn about what the temporary visiting scholars have been up to – and celebrate them, their endeavours but, most importantly, the depth and diversity of their own, grand, collection. I spent a couple of afternoons preparing for my hour in the sun (so to speak), and enjoyed pulling together my disparate notes, scribblings and thoughts into (what I hope) was a coherent whole. As ever, once I’d summoned my energies and efforts to crank up my laptop (and my brain), the content of my PowerPoint presentation just grew and grew. It’s not until such moments of enforced review and reflection that one realises just how much archive material has been collected, and noted, and dealt with. I’ve (almost unknowingly) covered a lot of ground these past few weeks. What’s more, preparing a seminar is a really useful step in the analytical process because it requires the researcher to take up a new position in their project, having both proximity to and distance from their work. The close reading, deep focus and utter absorption of solitary days in the archive are usefully punctuated by the ‘going public’ that a presentation brings. There’s an important shift of gear as one has to serve an external audience rather than a lone, internal, voice. Putting it another way, having to explain the significance and importance of a ‘find’ or ‘finding’ to make sense to someone else assists, I think, in moving a project along to the next level. It is, as the saying goes, ‘good to talk’. My final presentation consisted of 40 slides and mapped out the key themes I’ve been conjuring with these last few days and weeks. And while there’s a long way to go, those 40 slides present maybe the bare bones, or just the merest whiff, of a more formal piece of writing such as a journal article or chapter. 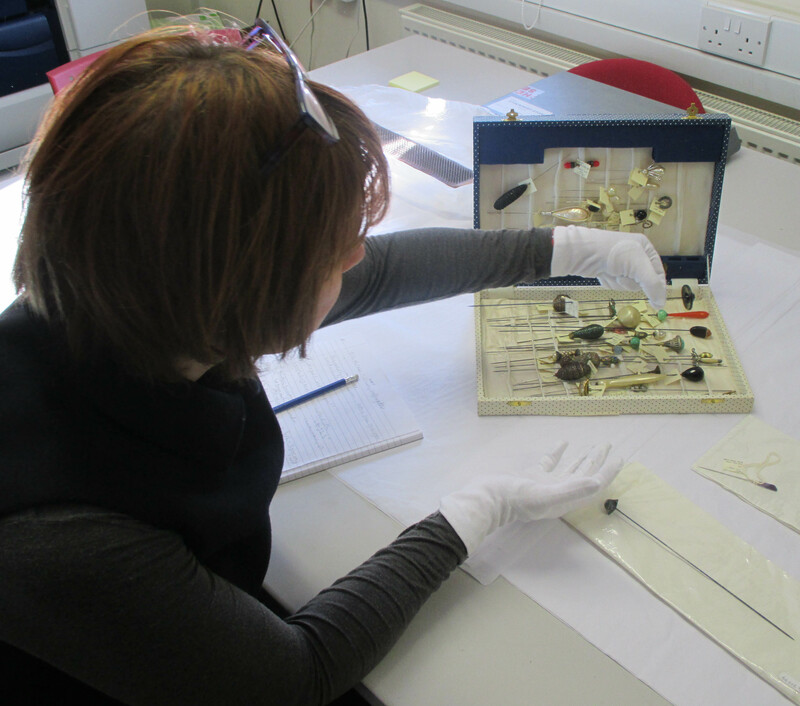 The exercise certainly got me working with, and using, the material I’ve been busy collecting in the archive. And that raises an important point about research, particularly of the type with which I’m concerned. I can ‘slam dunk’ as much archive material as I desire (and by that I mean looking at, and recording, folder upon folder of archive documents and texts: tagging them, labelling them, coding them for future use once I get back to Manchester and my workaday routine). But it doesn’t really count a jot unless I write up those records and notes into fully fledged, theorised, prose and get my interpretation of them ‘out there’. Research has to be released from the hard drive, the notebook and the memory card. And that process of release is the tough part because it requires saying something meaningful, slogging it out at the computer keyboard and running the gauntlet of peer review (among other things). A dose of courage and conviction is required for this stage of the academic process. Cups of tea are also very helpful. Happy memories of California will warm my cockles if the going gets as tough as I suggest above. For there have, of course, been highlights here at the Autry (or, perhaps more accurately, a small but satisfying inching forward of progress). These small pleasures add up to a splendid whole. The leathery smell of Helen Ruth Zeigler’s 1930s cow skin chaps, for example, as I (the first visiting researcher to do so) examined them fresh from the storage freezer. The gasp-out-loud moment as a dozen tissue-y neck scarves were unfurled, in turn, from their bespoke roller casings, revealing dazzlingly-preserved crimson, orange and gold printed silk. There was even a glorious moment in the permanent exhibit as I happened upon none other than Champion The Wonder Horse’s bridle. But perhaps most memorable will be the enthusiasm and encouragement from my Autry co-workers, who provided expertise, kindness and companionship on the long trail through ‘Archive Country’. And what a pleasant and scenic place that particular country has proven to be this last while. One of the dude ranch vacation brochures from the Autry collection that I’ve been working on likened a trip to rural Montana as being ‘Big Medicine’ back in the 1930s. Some 85 years or so later, my own trip ‘Out West’ has similarly proven a true fillip. The Levi’s ‘100% Electric Rodeo’ puppet show as it toured the West, performing here at the Southwest Exposition & Fat Stock Show, 8th March, 1940. Source: Fort Worth Public Library Archives. At first glance, certain archive objects, such as a postcard, may appear mundane. Yet, with just a little bit of investigation, that same mundane postcard can become mesmeric, opening up avenues into history unfathomable. Telling the stories behind ordinary artefacts (such as a mass-produced souvenir) is what makes research about material, and popular, culture so compelling. The ordinary becomes extraordinary with a bit of digging and insight. I had one such encounter in the Autry archive last week as I went diligently about my labours up in the reading room on the first floor. A search of the archive catalogue had thrown up this reference to a postcard from 1939 featuring an image of the ‘Levi’s Electric Rodeo’. Almost dismissing it outright, since rodeos aren’t my research focus, I did a quick Google search (yes, the last refuge of the research scoundrel) with surprising results. 1939 was not only the year of the World’s Fair in New York but also the year of the, now lesser known, West coast counterpart, the Golden Gate International Exposition in San Francisco. The theme of the GGIE was ‘Pageant of the Pacific’ and land was acquired to build the campus of ‘Treasure Island’, which promoted San Francisco as a hub for arts, culture and business in the Pacific Rim. 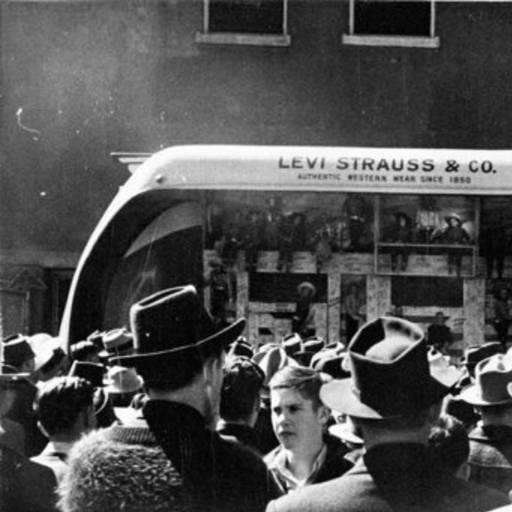 Home town company, Levi Strauss, the famous denim jeans manufacturer created an ‘Electric Rodeo’ for the Expo, which was pioneering in its technology as an automated sideshow and proved to be exceptionally popular with visitors in the ‘Vacationland’ entertainment area. The reverse of the postcard held in the Autry collection (which was distributed at the GGIE along with a booklet, apparently, that described the making of the attraction) lauded Levi’s innovation thus: “A 100% electric rodeo. It moves. It talks. Its figures are all hand-carved likenesses of famous rodeo people. And they’re all dressed in authentic Western togs…miniature replicas of garments made in California since 1853 by Levi Strauss & Company”. 31 wooden puppets performed to a vinyl soundtrack of western music in a 20-minute show that featured a bucking horse, a clown and mule, announcers and judges. Ain’t that a thing? It appears that the touring Electric Rodeo had a reasonably long and illustrious career, thrilling spectators throughout the 1940s (as this wonderful, and decidedly fifties-style, image testifies). 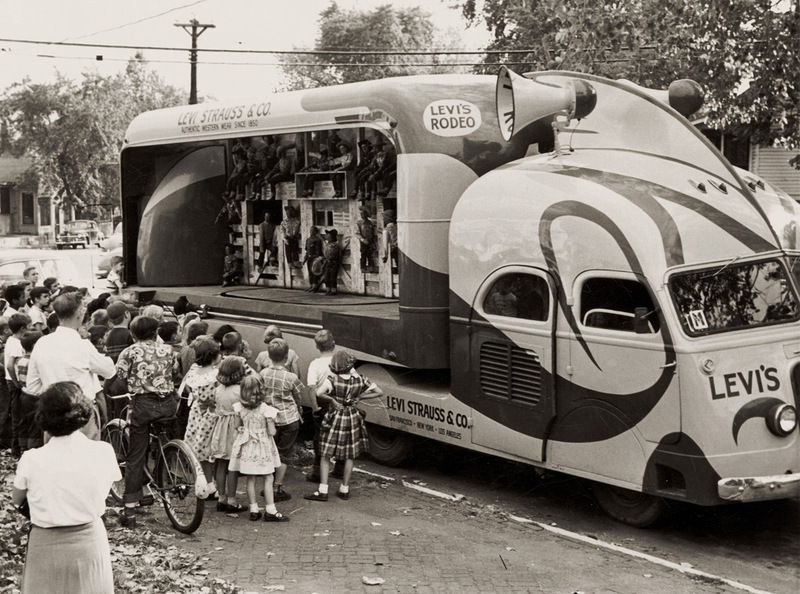 For example, The Lodi-News Sentinel from Thursday August 14th 1947 announced that “rodeo-minded youngsters will be preparing for a treat when the big Levi Strauss puppet rodeo” rolls into town for the annual nine-day long Lodi Horse Show. A similar announcement was made in The Corsicana Semi-Weekly Light from September 22, 1950. The tale of the Electric Rodeo, once so sparky and sizzling, ends here with mixed fortunes. 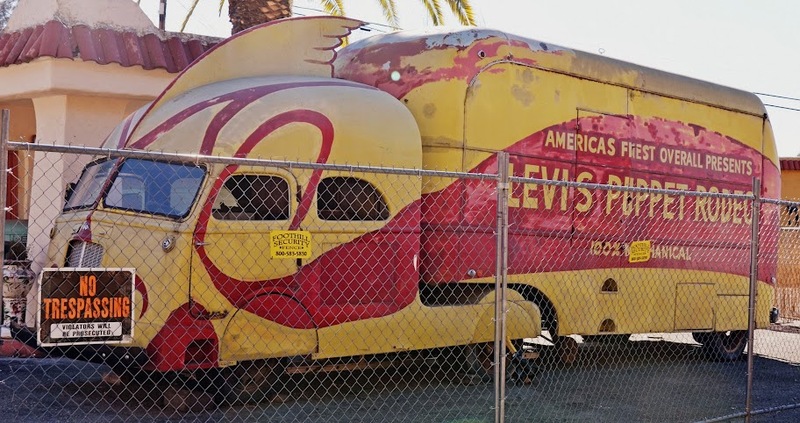 The shell of the streamliner truck now languishes in a parking lot in Newcastle, CA, bereft of its interior treasures. Rather poignantly, too, only a couple of the miniature jeans (bereft of their puppet-y owners) are said to be stored in the official company archives of Levi-Strauss, along with some promotional papers from the original 1939 Expo in San Francisco. But Levi’s have not restricted their voltaic moment in history to a pair of pint-sized pants. For, in 2014, the company took inspiration from its highly-charged past and commemorated the 75th anniversary of the Electric Rodeo by reproducing some of the puppet outfits in their aptly-named 2014 ‘Treasure Island’ collection, which you may marvel at here and here. And all power to them! In the 1930s, tourists were variously motivated to head West for the Season and take a vacation on one of the dude ranches that proliferated at that time. Getting away from it all; the nostalgic pursuit of the Old West; the indulgence of a Hollywood cowboy fantasy; the healthful benefits of leading a simple life in the restorative outdoors: all of these are themes that are looming large in my readings of touristic ranch brochures from the period (and I’m finding that the Autry has a wonderful collection of brochures and related ephemera in its holdings). One slightly more novel reason, which, admittedly is less prevalent in the standard marketing material is what we would term today as the ‘quickie’ divorce. The 1930s saw the inception of the ‘divorce ranch’, a phenomenon that was restricted to the state of Nevada, and, particularly the locale of Reno, which came to be known as ‘Sin City’. In the midst of the Depression, the State authorities capitalised on an opportunity to build on existing liberal legislation and generate revenue from, often wealthy, often female, divorce-seeking visitors: part of the ‘migratory divorce’ trade. And this was no small trade – the statistics are remarkable. In her excellent article for the Nevada Historical Society Quarterly, Mella Harmon suggests that during the ten-year period from the stock market crash in October 1929 to the end of 1939, approximately 30,300 divorce-seekers alone (not including defendants, soon-to-be spouses, children, parents, attendants, and others accompanying a plaintiff) were present in Reno. Of course, all of these incomers required accommodation and entertainment. Some (certainly not all) found that local dude ranches, such as Pyramid Lake, offered a suitable, secluded, setting for ‘sitting out’ the statutory six-week long period required of the law to claim residency in the state of Nevada, and thus invoke its lenient divorce laws. Reno became infamous as the divorce capital of the USA (and even Europeans travelled, on occasion, to take advantage of its fast-tracking). ‘Going to Reno’ entered common parlance as a shorthand for ‘getting a divorce’, as well as terms such as ‘Reno-vation’ and ‘taking the six-week cure’. No blog entry attempting to forge a connection between dress history and divorce ranches would be complete without mention of the important and iconic film The Women. Produced in 1939, the film is of a suitable vintage not to trouble my twenties and thirties focus. But where to begin with a synopsis of its plot? For this film somersaults with twists and turns, and, to my English ears, the dialogue is so incredibly pacey and wise-cracking it requires every ounce of concentration with viewing (and you may view its full-length entirety here). Directed by George Cukor and based on the play by Clare Booth Luce, the cast includes Norma Shearer, Joan Fontaine and Joan Crawford. Set in Manhattan, the comedy-drama follows the life of Mary Haines and her pampered acquaintances. At a beauty parlour, a loose-tongued manicurist reveals that Mary’s husband is having an affair, which (cutting a long and involved story short) leads to Mary and her friends heading to a Reno divorce ranch to file for divorce. The costuming throughout is spectacular, showing the high fashion get-ups of 1930s New York, and also the Western-wear donned by Eastern would-be divorcees at a dude ranch. But, most astonishing of all, is a ten-minute long interlude mid-way in the film when the women attend a fashion show. Shot in full techni-colour (the remainder of the film is black and white), the show features a host of gowns by the celebrated Hollywood costumier, Adrian. This is extraordinary stuff, quite ahead of its time, and nothing short of bedazzling. It has it all. And it offers a useful organising frame through which my seemingly disparate interests (ranches, fashion, divorces, dudes, 1930s and so on) may logically be corralled (pun intended). Thanks to Chris Martin and Gwyneth Paltrow, we’re already familiar with ‘conscious uncoupling’. Thanks to The Women I may have just discovered what fashion-conscious uncoupling looks like. Detail of swimsuit by Fellegi for Cole of California, 1936. Los Angeles County Museum of Art (M.74.76.11), Costume and Textiles Collection. An example of the Matletex process. If my ‘Buckskin and Ballgowns’ project brings together cowgirl dress, resort wear and 1930s fashion (which, I believe, it does), then my latest Youtube discovery is right on message. My ‘find’ is a short, 20-minute film from 1940, titled Fashion Horizons (click the link to watch). Although new to me, Fashion Horizons has, so it seems, something of a cult following in the online world of discussion boards and fan sites, particularly so among aviation aficianados*. While for some, the aircraft may be the star of the show, for me, and anyone with a penchant for American fashion history, the clothes are out of this orbit (to use a suitably airy phrase). The location, the looks and also the brilliant musical score (which will stay with you as an earworm for days hence) are so evocative of the era. It’s a must-see. It’s difficult to fathom the provenance, or even the purpose, of Fashion Horizons. The film is a travelogue made, I assume with some guesswork from the opening credits, in collaboration with Paramount Pictures and Transcontinental & Western Air (TWA) . It’s, presumably, a promotional piece that showcases a number of loosely-related creative industries: the sleekly modern aircraft of TWA; the burgeoning talents of ascendent Paramount film starlets, and the glamorous resort fashions of the early forties (just to clarify, the film was made in 1940 and debuted collections for 1941). The somewhat curious premise is that Paramount’s leading lady, Mary Martin, along with some aspiring actress friends, are called to a screen-test ‘Out West’. Taking the luxurious TWA Stratoliner (complete with its own ‘Charm Room’ to cater for the needs of female travellers) across the US from La Guardia in New York City to Los Angeles (via Chicago, Kansas City and Albuquerque), the viewer is treated to panoramic views and is tempted by a richly poetic (and, at times, socially and culturally problematic) narrative from CBS announcer Wendell Niles. “It’s a fairy land of tumbling castles far above where the raindrops form”, goes Niles’s voice over. Oh, what stirring stuff! The fashions showcased in the film are described in great detail, and lingering shots, enhanced by glorious technicolour, give a sense of the vibrancy of resort dressing, which was fun, bold and colourful. During their tour of the West, the would-be actresses stop off for a week-long vacation at Camel Back Inn in Phoenix, Arizona and this vignette offers a glimpse of contemporary ranch life. A couple of the women go for a breakfast ride dressed in what is termed as ‘frontier costume’, comprising “frontier pants, western high-heeled boots and ten gallon Stetson hats”. But the ranch vacation is depicted as far from being only about horses and cowboy hats. All manner of (slightly bonkers) scenarios are deployed to display the latest fashionable styles: a dinner engagement; sun lazing by the pool; a game of shuffleboard; a cocktail party; sightseeing; a boat trip etc. The ranch vacation, as my thesis for the ‘Buckskin and Ballgowns’ project asserts, required a diverse and distinctive wardrobe. American sportswear of the thirties (or, in this instance of 1941) catered for women who required a versatile, practical, yet stylish, form of dressing (and I’ve written about this in previous blog entries such as this one in relation to the contemporary designer Elizabeth Hawes). Fashion Horizons features an entire raft of examples, one such being when ‘Margaret’ plays a game of shinty, casting aside her wrap-around skirt to reveal a swimsuit worn underneath. This mixing and matching of combinations was a typical feature of thirties (okay, 1941) fashion, which catered to the changing demands of modern lifestyles. Midriff-showing shorts and cropped top combos, short-legged playsuits and swimwear separates were all the rage. Importantly, for the dress historian, the narration goes on to describe to the audience the way in which Margaret’s swimsuit was manufactured: “shirred and elasticised in a new process called Matletex”, which had “a slenderising effect”. Technological advances in textile engineering and clothing design were celebrated and lauded as a means to promote garments to women seeking to embrace innovation and a modern sensibility. And a note of explanation for those not entirely au fait with Matletex. Pioneered in 1936 by Margit Fellegi when she was working for the Californian swimwear label, Cole’s, Matletex enabled cotton fabric to be shirred (that’s a sort of smocking technique) on elastic thread. The result was an ability to manipulate style lines without sacrificing closeness of fit. Figure-hugging designs and functionality were brought together. Matletex gets several mentions in the film, which suggests techy-talk was a selling point for consumers: what those in the trade would term as a ‘value-adding’ property. Consumers were seduced by the ‘latest thing’ and bought (literally and metaphorically) in to technology in order to signal their own credentials as forward-thinking and fresh. It only remains, then, to quote from the closing lines of Fashion Horizons, which invoke a suitably awe-inspiring and thrusting tone. Onwards, and, indeed, upwards! “…the girls are reminded that horizons in the air, like fashion horizons are reached only to reappear again and again. As Tennyson said only a century ago, ‘For we dipped into the future as far as human eye can see/ Saw the vision of the world and all the wonder that would be'”. * You know who you are!